Aldous Leonard Huxley (July 26, 1894 – November 22, 1963) was an English-born writer, whose masterpiece novel, Brave New World, depicted a future in which universal happiness is only achieved by thoroughly dehumanizing humanity. Though best known as a novelist, his wide-ranging output also included essays, short stories, travel writings, poetry, plays and screenplays. Although a mocking critic of social mores, Huxley was essentially a humanist, and, by his life’s end fully embraced spiritualism. The maternal side of Aldous Huxley’s family was no less august. His mother, Julia Arnold, was the niece of the poet Matthew Arnold and sister to the author Mrs. Humphrey Ward. She was also the founder of the Prior’s Field School, an all-girls boarding and day school. Aldous Huxley’s education was initially tended to by his mother. When her terminal illness made that impossible, Huxley continued his studies at Eton College and eventually graduated from Balliol at Oxford University. During a brief tenure as French teacher at Eton, Huxley made the acquaintanceship of George Orwell, then one of his students. In the years between Eton and Balliol, Huxley contracted an eye infection that left him essentially blind for a few years. Although he recovered his vision well enough to complete his studies, his vision would trouble him throughout his life. This medical crisis, along with the death of his mother when he was fourteen and the suicide of his brother, his closest companion, a few years later, would leave Huxley with a life-long preoccupation with transience, of both joy and life. His diminished vision made Huxley unfit for military service during World War I. Instead, Huxley turned to employment in the Air Ministry, before abandoning administrative work in favor of working as a farm laborer at Garsington Manor, the farm of Lady Ottoline Morrell. There he was first introduced to members of the Bloomsbury Group, including D.H. Lawrence, whose friendship would inspire Huxley’s writing and last until Lawrence’s death in 1930. At Garsington, Huxley also met Maria Nijs, Belgian refugee. They married in 1919 and had a son, Matthew, a year later. In 1921, Huxley published his first novel, Crome Yellow, a thinly veiled satire of his time spent at Garsington Manor. Over the next decade, he would publish three more novels, essay collections, short stories and travel writing, before publishing Brave New World in 1932. 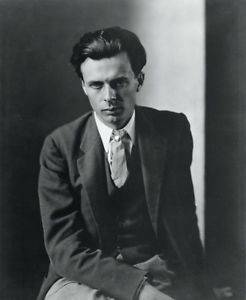 In 1937, Huxley and his wife and son immigrated to the United States, settling in Taos, New Mexico. They were accompanied by family friend Gerald Heard, who introduced Huxley to Vedanta, meditation and vegetarianism through the principle of ahimsa, or the abhorrence of violence against any living thing. During this time, Huxley articulated his spiritualism and values in the Perennial Philosophy and published two more novels. He also worked as a screenwriter in Hollywood, but found little success. His most notable failure was a treatment for Alice in Wonderland, which Walt Disney rejected as incomprehensible. Convinced that a change in environment would help his troubled eyesight, the Huxleys decamped for the desert town Llano, California. Here, Huxley’s interest in psychic awareness grew keener, and he began to experiment with psychedelic drugs in pursuit of spiritual enlightenment. His drug experiences were detailed in The Doors of Perception, published in 1954. Huxley’s wife Maria died from breast cancer in 1955. He remarried, to writer Laura Archera in 1956. In 1959, Huxley was awarded the American Academy of Arts and Letters Award of Merit for the Novel. Huxley’s health continued to deteriorate after being diagnosed with oral cancer. His battle with cancer informed the writing of his final novel, Island, in which the gentle inhabitants of the fictional Pala Island are doomed by their pacificism. On his deathbed, Huxley, who had lost his voice due to the ravages of oral cancer, wrote a request to his wife for “LSD, 100 mg, i.m.” according to The Timeless Moment, her biography of Huxley. He reportedly died peacefully in the afternoon of November 23, 1963. News of his death was overshadowed by the assassination of President John F. Kennedy, which occurred on the same day, as did the death of English writer C.S. Lewis.